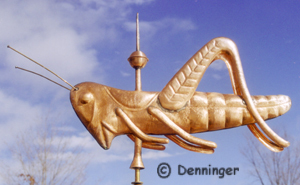 The grasshopper weather vane atop Faneuil Hall in Boston is a famous example of our American weathervane heritage. It was made in 1742 of gilded copper with glass eyes, by Shem Drowne. Peter Faneuil built the brick building at his own expense and donated it to the town for the new central marketplace with a second-story town meeting hall. 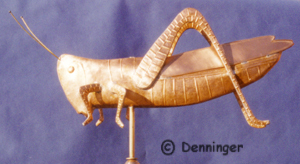 Faneuil selected the grasshopper because at that time it had become the trade emblem for a merchant exchange. The grasshoper was a copy of the vane on the Royal Exchange in London, founded by Sir Thomas Gresham whose family crest was the grasshopper because the name "Gresham" meant "grass cricket." This style was popular from the 1700's right up to the Victorian era, and is also very striking with contemporary vanes. 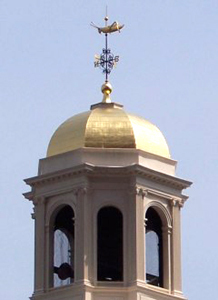 Traditional mounting of a weather vane into the solid headblock of a cupola, tower, turret or gazebo, or into the ridgepole of a roof. 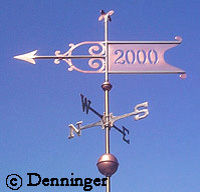 This is the "old fashioned" traditional way of mounting a weather vane. It is still suitable today for smaller vanes up to 36" wide. Our basic 28 1/2" rod allows for at least 8" - 9" of rod to be wedged and caulked into a solid headblock or ridgepole, and 16" - 20" of rod exposed above the apex of roof. A preferred traditional mount into the solid headblock of a cupola, tower, turret or gazebo, or into the ridgepole of a roof using a brace for extra strength. Prepare your roof ahead with this headblock and brace system, for an easy and very secure mount. 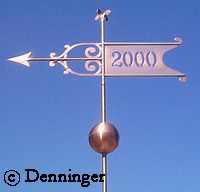 This mount is suitable for any size weather vane. Our basic 28 1/2" rod allows for at least 8" - 9"of rod inside the roof, and 16" - 20" of rod exposed above the apex of the roof. A nail is used to pin the rod to the brace. Larger sized vanes will need proportionally heavier and longer rods. Installation may vary with each building. so you can enjoy it for generations to come. See our Mounting Diagrams for even more options. (yes anything) including: size, shape etc. Just consider it a custom design. Shipped in the USA and Worldwide via UPS or best way. Your shipping costs will only be the actual carrier charges,determined upon size and weight of packed carton(s). Largest sizes may require a wooden crate, and item will be sent via Truck. Call for delivery schedule - each item is individually handcrafted for you. We use recycled and repurposed packing materials whenever possible. All contents © 1988-2016 AHD. All Rights Reserved.